The January transfer window slammed shut yesterday on Fulham, with a small amount of movement in and out of Craven Cottage. How does the window rate, and are we happy with how it went? The Fulhamish team are here to give their thoughts! January was a period that promised so much, with the public backing of the owner to Claudio Ranieri and the Director of Football promising to work “tirelessly” to provide multiple signings. However, the arrival of Havard Nordtveit, Lazar Markovic and Ryan Babel have failed to inspire Fulham fans following the action across the day. What do the Fulhamish squad think of the window’s deals? So Fulham finish the day by signing Lazar Markovic from Liverpool. According to the club website it was based on Aleksandar Mitrovic’s recommendation. I love Mitro, but I think he should be focusing more on scoring rather than scouting. Fulham are conceding over two goals per game currently, Alfie Mawson has a serious injury and the only defensive player we’ve brought in is Havard Nordtveit. I’m not knocking Havard, but he hardly set the world alight at West Ham, and most importantly his best football has been played in defensive midfield, not in defence. Ultimately, we should never have been in a position where January was so crucial, but it was, and now I think even more writing is on that wall. Ultimately this January transfer window felt like waking up at Christmas and finding out your Mum has bought the game that came out last year, not this. Despite the public backing from the owners and directors, this transfer window showed no direction and no hint of progression towards the overall goal of safety. Key areas that needed addressing were missed, and blatantly too, which provides the lingering feeling of frustration and exhaustion. Whilst Ryan Babel has been a pleasant surprise, the arrival of Lazar Markovic was a bolt from the blue. Had this transfer happened four years ago, then I’d be excited and optimistic, but this is a young player who has failed in every move since excelling for Benfica all those years ago. Nordtveit is a bright spot in this window, clearly a fine player in a holding midfield role, his time at West Ham at centre-back overshadows a player who has the attributes to boost the midfield. The positive here is that all the players arrive on short-term deals that provide Fulham with less of a risk than going all-in on a £15M player from the Greek League. Perhaps this would have been a time for Fulham to show their direction, for the moment we remain a time that lacks identity and consequently a long-term plan. It’s not been the transfer window that any of us dreamed of. Hopes of bringing in promising Bordeaux right-back Youssuf Sabaly were dashed at the last minute, as Fulham were forced to settle for out-of-favour Liverpool cast-off Lazar Markovic, who joined up with the ‘blessing’ of Aleksandar Mitrovic. FFC were desperate for defensive reinforcements, and have only picked up Norwegian international Havard Nordtveit. West Ham fans remember him with absolutely no fondness whatsoever, but, and whisper it quietly, the word from Germany doesn’t seem as bad as it might have originally seemed. A natural leader, by most accounts, he may be the added steel that would allow Fulham to revert to a back four without being petrified by every attack. Markovic, too, brings options; and even though he added depth to an already heavily over-indexed position, his pace and desire to play on the right of a three could yet see him make an impact. Sabaly breaks my heart, but ignore all this nonsense you hear about meeting release clauses – having them in written contracts is illegal in French football. Bordeaux might have been out of line if they had a verbal agreement with the player, but they’ve not done anything technically illegal. With the already improving Babel in the ranks, the window has perhaps not been as bad as originally feared, but the lack of defensive reinforcement does show a severe lack of foresight from the very top. The January window had provided such promise and potential with Shahid Khan publicly coming out and backing Claudio Ranieri. We all had hope that if CR had some say on transfers he might improve our utter shambolic defence. Well this didn’t happen. Then come the end of the window we’ve ended up with no out and out defenders. Not that I’m against signing Babel & Markovic. But you’ve really got to ask what has TK been doing all month. He’s ruining all of Shad’s good work & maybe it’s time we get someone competent enough for the role instead of someone who treats it like a toy handed down from his father. The Brighton game on Tuesday was exhilarating as it was exhausting, with defensive flaws laid bare again. Those problems need to be attributed a little further up the club hierarchy than just the defenders and manager. The summer transfer strategy was ‘buy now, think later’, particularly when it came to the neglected defence. It currently consists of players who are capable but also suffer from a Senderos-esque affliction of “having a mistake in them” each game. The arrival of Havard Nordtveit can hopefully improve that, even if he doesn’t look like a major upgrade. Lazar Markovic is an underwhelming signing – like Mark Hammill, it’s likely to be cameo appearances only for him. Ryan Babel on the other hand has impressed so far. Key performers in the squad have been held on to but is the club in a much better position than before the new year? Not really. 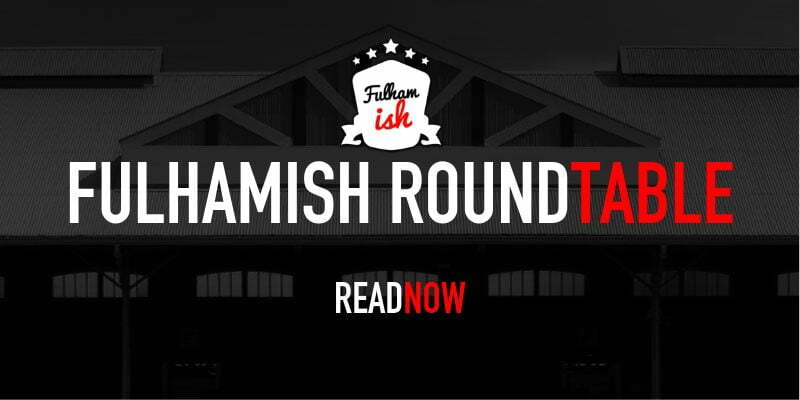 Given our current predicament we probably all expected more defensive reinforcements – but in typical Fulhamish tradition delivered the unexpected rather than the required acquisitions. The closest to a defensive strengthening cane In the form of a Norwegian CDM/CB. Nordtveit didn’t have the most successful spell during his time with the Hammers, and I’m not going to get carried away with his arrival if being brutally honest considering some of the more ‘suited’ names we were linked with. Markovic has talent, is young(ish) and could be shepherded under Mitrovic to give us an extra spark that maybe our other ‘wingers’ don’t have for this league. My three word review of the window: Sensible but underwhelming. I’m glad that we didn’t spend any money, as the risk of relegation could cause us some serious financial issues down the line. However, it is strange that we chose to strengthen where we did, and the players brought in don’t look like any more than reserve options. Time will tell, but at this point it doesn’t feel like the window has added any significant value to our survival quest.